Delaunay triangulation and Voronoï diagram « HIDIHO! the Delaunay triangulation is really helpful when it comes to physics. It also creates beautiful shapes. I am writing this one specifically after having read this post on Keith Peters’ blog. More than a year ago as I was looking for algorithms to create a ‘bacteria generator’, I found the work of flight 404. he was working on his voronoï butterflies. His work is definitely one of my sources of inspiration. So I became eager to do the same in flash yet at that time I didn’t have the skills to do so. Earlier this year, I talked to Didier Brun about how crucial and useful the tesselation (triangulation) could be and shown him the various ways I had tried to achieve the port of this (beautiful) algorithm. creating ‘robust’ meshes namely something that does not ‘collapse’ on itself and has no redundant vertices, something to do with ‘minimal structures’ in architecture. I’m already using it in a production workflow to segment objects on the fly and it is working just fine. 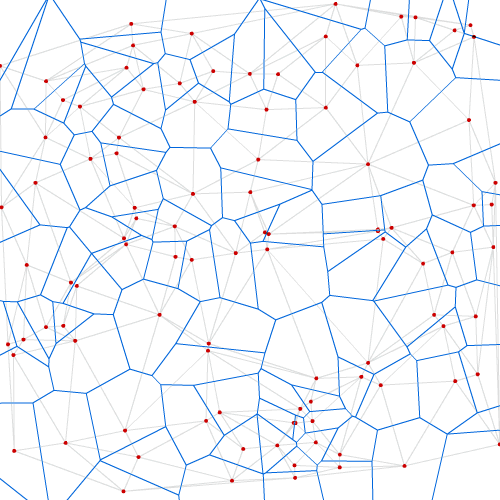 I’ve also added it (along with the voronoi diagram) to the BIGA repo. I really have to thank Didier. thanks to him I am no longer afraid of porting algorithms from other languages. check the scaleX article ; the port of the C algorithm was done after I did the Delaunay one.